Roughly the size of a paperback book, this 16 cell braille display enables you to read information in braille and control your portable devices while on the move. Connect via Bluetooth to your laptop or your iPhone enabling both braille input and output. 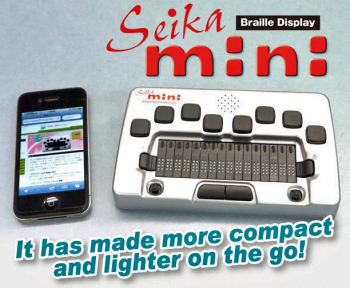 You can also use the Seika mini without an additional device to make notes, use the calculator and a number of other useful applications.